Just Click Photo to go to shopping cart! Gold-Bearing Quartz is one of the world’s rarest forms of natural gold. It is found underground by hard rock miners in only a few locations in the world. This unique formation is being mined below the earth’s surface. The natural veins of gold were formed by hydrothermal pressure deep within the earth millions of years ago. 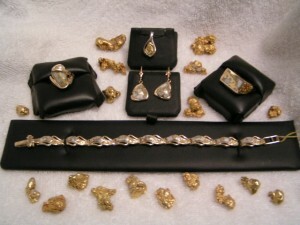 The quartz comes in various colors and sometimes contains other minerals. Pearl white is considered the most desirable and is used in our jewelry.